Imagine a succulent hothouse cucumber just brought from the grocery store. Envision that cucumber with a tender, slightly fuzzy yet edible rind. Enter the Painted Serpent Cucumber. This beautiful dark and light striped cucumber is not that good for shipping purposes but is definitely worth buying if you stumble upon it at a farmer’s market. In almost every way – except botanically speaking – this cucumber is the polar opposite of the regular Armenian cucumber. Many people call it an Armenian cucumber because it is a C. melo and can easily cross with a regular Armenian cucumber. 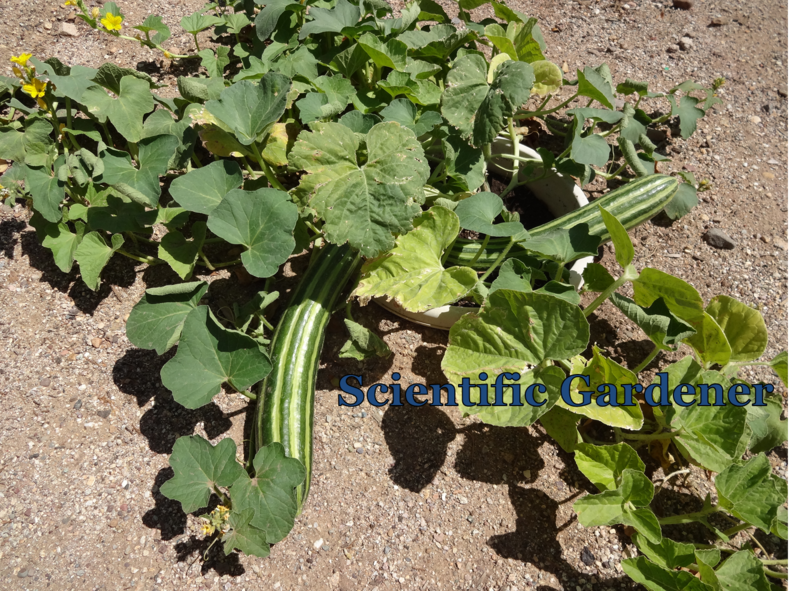 Though cross-pollination with its better known cousin is possible, it differs from the regular Armenian cucumber in growth pattern, disease resistance, soil fertility, taste, and in how the cucumber looks. The first thing you notice when growing this variety is that it grows slowly. 80-90 days can be a very long time to wait to see your first cucumber. It requires a long season and can take a while before you see your first female cucumber flower. So be patient – it will be worth it. On the other hand, disease resistance for this variety is phenomenal. It can often resist the powdery mildew and mosaic virus that plague other melon varieties. No melon variety is bullet proof, but this one can be exposed to a lot of diseases without succumbing to them. This cucumber variety requires much more fertile soil than its light-colored counterpart and will reward you well if you will consider saving a patch of well-composted dark soil for it. The taste of this variety is incredible. The closest thing I could relate to it is something between cucumber and pure water. The texture is crisp, yet tender and smooth. Dark and light green stripes decorate the rind and it tends to grow very long before plumping out. The beauty of this variety definitely place it in the specialty category. If you do not see it in gourmet restaurants take comfort in the fact that you can grow something more delicious and fancy straight from your garden. The fuzz factor on this variety is slight to mild. Not as much as some other cucumber-melon varieties but definitely more than the regular Armenian cucumber. When mature, Painted Serpent Cucumbers exhibit minimal fuzz. Do not let the season length keep you from growing this variety. Plant some regular Armenian cucumbers next to this variety and don’t let the regular Armenian vines shade out the Painted Serpent. When the regular Armenians start dying out this variety will begin pumping out the fruit. 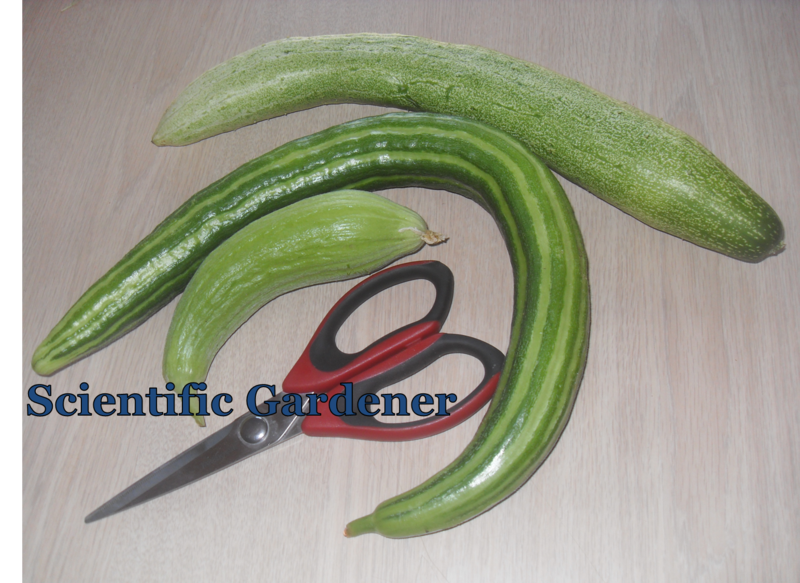 (When doing this for seed saving, cut back the regular Armenian cucumbers as soon as you see the first Painted Serpent female flower). If you take good care of your Painted Serpent cucumber vines the total amount of fruit throughout the season should be comparable to that of the regular Armenian cucumber and, in my opinion, even more delicious! 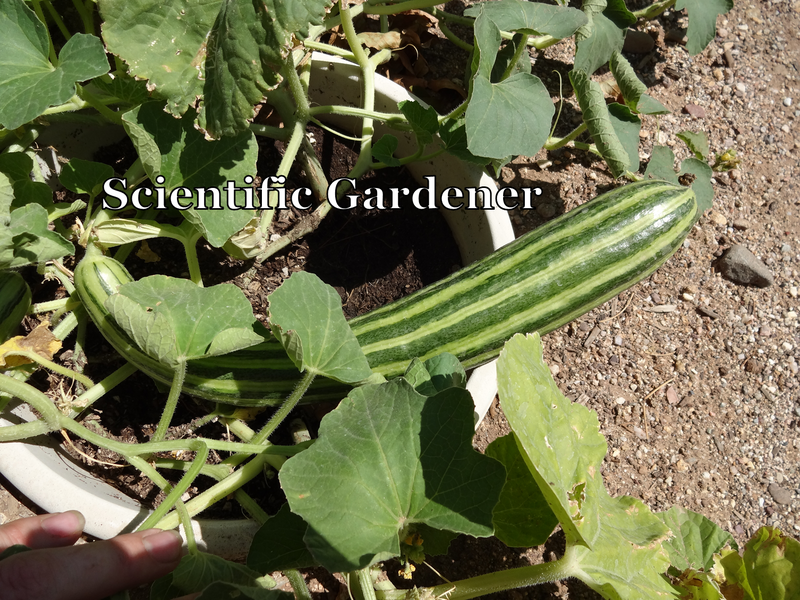 This mature cucumber will produce lots of seeds. Update: I now sell this, and many other varieties like the Painted Serpent Cucumber at Cucumbershop.com. My son in front of my garden with a Painted Serpent Cucumber. Jay - I've never seen/heard of Painted Serpent. Some questions: since it follows the Armenian after the Armenian dies off, I assume it is able to withstand very hot, humid summers? Did you get your seeds at the farmer's market or a seed vendor? Yes- the Painted Serpent does very well in the heat. They are available online from seed vendors. However, as I have often bought Armenian cucumber varieties that have not fit either the description on the packaging or the picture I am now growing these for myself. I hope to eventually open a store of my own to offer some cucumber-melon varieties with correct descriptions and pictures. Where did you get the seeds for the true Painted Serpent variety? All my cucumbers succumb to powdery mildew by mid summer (NYC, hot and humid), I am looking for a variety that can continue healthy grown. I'm BACK!! The Painted Serpents are a great variety for Hydro in High Temps! My solution is in the mid 90's.... And these plants DON"T CARE! This grow I'm pruning and topping. 2 plants in a DWC 17 gallon tote. As of now I have 9 fruit hanging. Thanks for pointing them out. Will the Painted Cucumber cross with a regular cucumber such as "Double Yield"? The Painted Serpent will only cross with other C. Melo varieties. 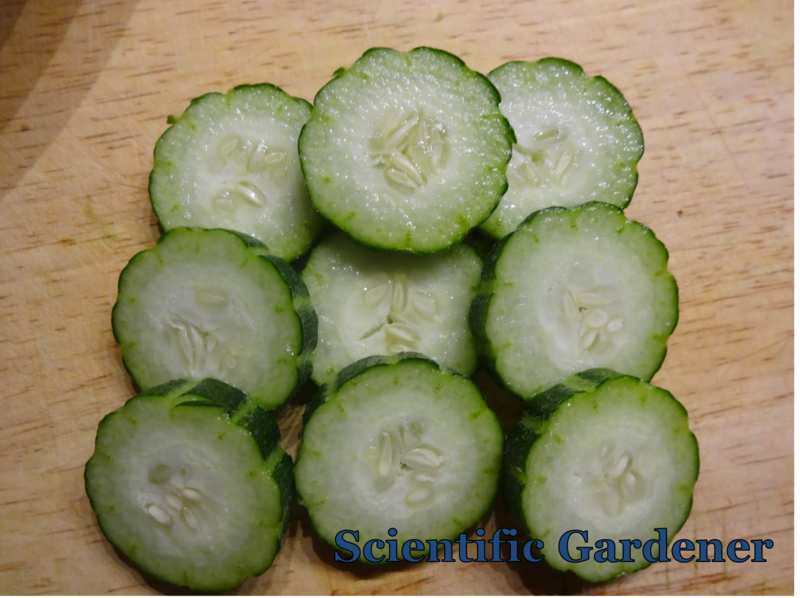 It would not cross with any regular cucumber varieties such as Double Yield, which is a C. sativus. Though the flowers are a little similar, there are some distinct differences. I have personally grown C. Melo next to C. sativus many times over the years and have never had any crossing whatsoever. I am glad to read about these here. I got some free seeds with another seed order. Only one seed germinated and right now I only have male blossoms. I was worried that maybe I needed more than one plant for them to produce. But I see that it can take a while to have female ones, so I will be patient and look forward to harvesting some eventually! I garden in Nebraska. I am growing these as we speak.. I've never seen anything like it. They taste wonderful however the seeds are very small so they can grow larger than a normal cucumber. I am seeing alot of male flowers and not many females. My 3 plants have grown around 50x50 patch and are completely filling my garden. Next year I will definately be growing them but using a trellis. I just pruned them and hopefully will get the side shoots of females soon since. Really hope I didn't shoot myself in the foot by pruning them. How well will this cucumber grow in a 5 gallon container?